The belts that convey every type of material require a frequent maintenance because, if the residues are not removed immediately after the point of discharge, these will accumulate on the pulleys and on the guide rollers causing wearing and damages to the belts themselves. 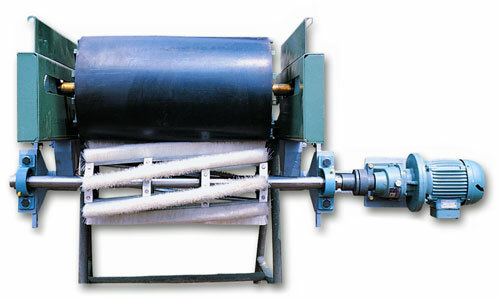 The Brushing Unit are designed and manufactured by SIT to obtain a radical cleaning of the belts, to avoid the inconveniences verified with cleaners of traditional type. 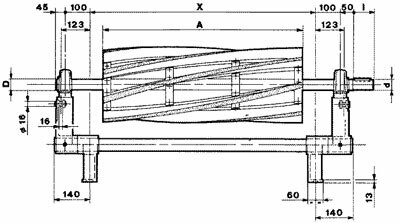 These patented systems for belts cleaning have	assembled as brushing gear a special cylindrical shaped brush with helical segments (strip)	(see constructive form Master Rollers). The engines usually mounted are asynchronous three-phased engine, 3 PH 220-380 V. Tension, 50Hz, closed construction, external ventilation and rotor. Protection IP44. B5 construction forms for UST type and B3 for USLT. The brush is operated by an electrical engine by means of a driving belt (USLT) or a geared-engine with helical coaxial gears with elastic joints (UST). The brush pressure regulation can be adjusted by the lateral eye pulling rods. The body of the brush consists of a steel shaft carrying turned cast iron disks, on which the Strip brushes are mounted using aluminum dowels screwed on them. 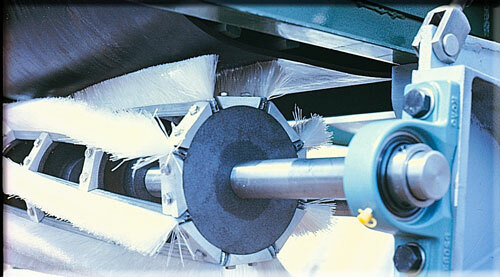 Type standard UST Brushing Unit (with driving gear motor in axis with the rotation axis of the brush). They are indicated for cleaning large conveyor belts and for harder working conditions for the transportation of gummy and humid materials. External diameter standard Ø 300 mm. On demand Ø 270-350 mm. Type Light USLT Brushing Unit (the engine is not in axis with the brush, fastening system lighter but it is more complicated to change the brushes). They are indicated for smaller conveyor belts, for light jobs and when there are difficulties of installing. External diameter standard Ø 200 mm. On demand Ø 180-260 mm. On demand we can manufacture also Brushing Unit with special size and special power supply, using specific types of filament and of structure to satisfy the brushing and mounting needs of the customer. 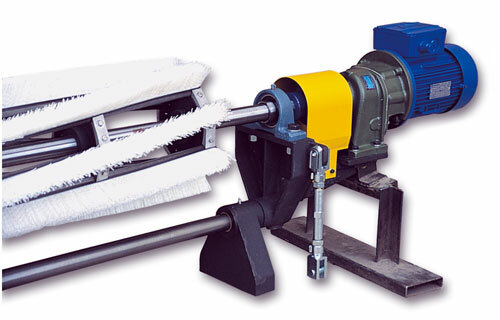 The Brushing Units must be mounted in parallel with the conveyor belt (pls. 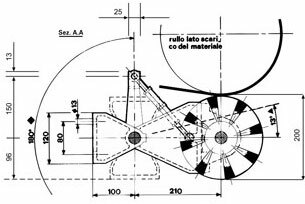 see picture), exactly where the belt leaves the head-drum or immediately behind the vertical of the drum axle	making sure that the supports are aligned. If the Brushing Units are mounted in any other positions, an idle roll must be placed against the other side of the belt, so that the brush operates where the belt is tight. The power supply must be provided so as to start and stop both brush and conveyor belt at the same time. It is recommended to bear in mind that the wires tips are constantly under working stress, therefore an excessive pressure would reduce the brushing effectiveness of the whole unit and accelerate the brush wear-out. The picture shows the correct bending of the filaments and the correct pressure between the brush and the belt. 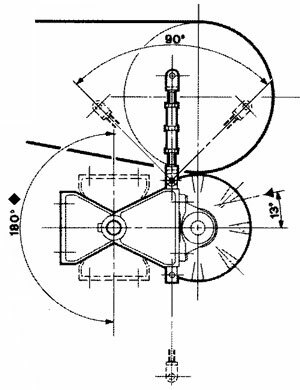 For adjusting the pressure it is sufficient to operate upon both side tension rods: this operation is important, because it allows to reduce the strip’s wear-out and without affecting thand cleaning operation of the conveyor belt. The strip brushes replacement is very simple and does not require disassembling the metal body. It is sufficient to screw-out the wedges held by a set of screws, then pull the brushes out either side ways or radial ways, depending on how you can grab them best. 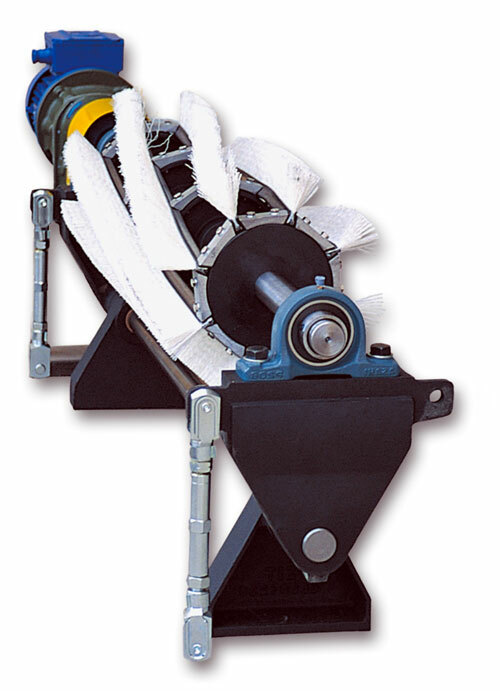 The rotation speed of the brush must be carefully selected in accordance with both the conveyor belt’s speed and the type of the material to be removed. The rotation direction of the Brush and of the conveyor belt must be opposite. Type and nature of the material to be removed and speed in m./sec. Example: a Brushing Unit type UST 700/900 x 388 rounds (i.e. 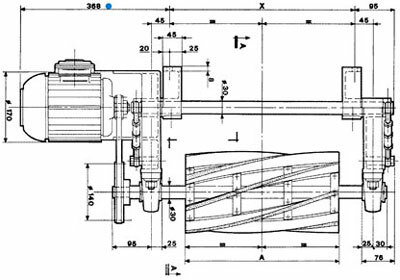 an UST type 700, “X”=900 mm., rotating speed=388 round/min. ), electrical three-phased engine 220-380 V., 50 Hz. The hypothesis expects the conveyor to carry carbon particles at 2m./sec. All the Brushing Units supplied by S.I.T. comply with the machinery coarse 89/392/EEC. Every Brushing Unit is provided with a User Manual, the Test certificate and the “Incorporation’s declaration”. 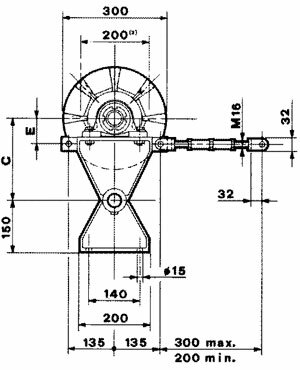 Every Brushing Unit on demand can be provided with joint protection properly fitted on the UST as flexible coupling; on the USLT for protecting the belt cone pulley. Below is a diagram showing how to choose the correct speed when using a 300 mm external diameter brush, depending on the conveyed material. In abscissa: speed of the conveyor belt m./sec. In ordinate: round/min. of the brush. In order to determine the speed reducer, it is suggested to round the speed reading off up to the closest reading available in the market. 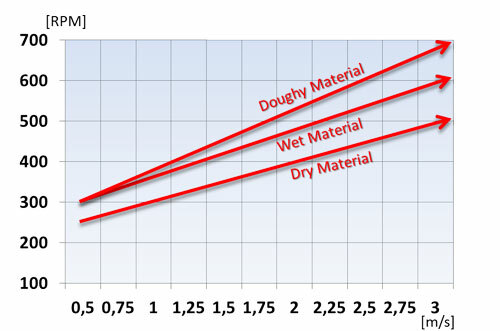 * On demand SIT offers different section diameters and filament type. Have you seen what type of Brushing Unit could be interesting to you? Contact Us and the experts of our Technical Office will help you identify the product that suits your needs best!